I finally got my Cadbury Creme Eggs after traveling half the county! Seems most places were sold out and several other stores like Target are closed. Walgreens to the rescue! My husband once bought me a whole case of them for my birthday (which fell on Easter that year) when we were dating. How could I not marry him after that! SHIFT by Jeri Smith-Ready Blog Tour Will be kicking off right here starting Tuesday!! There are over 200 participating blogs - the hop ends Monday night! The SHIFT Blog Tour starts Tuesday with AMAZING prizes!! 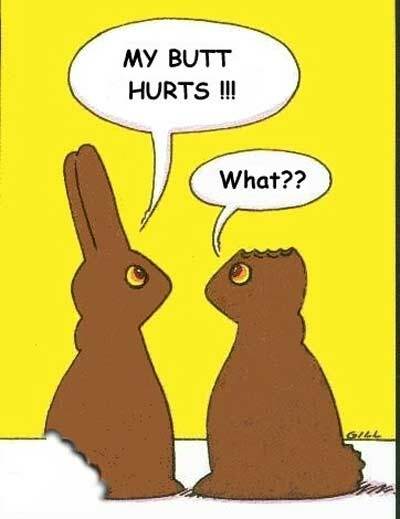 Happy easter Karen, hope you had a great weekend!! Can't wait to read those movie reviews. I'm hosting the family at my house so things will be crazy in a few hours. Have a great Easter! I love Cadbury's chocolate and have been in a permanent state of depression since moving to the USA since it is licensed to Hershey's over here and so tastes different. However, I guess they don't screw around with the creme egg recipe as they are addictive. I have this weird habit where I lick out the center part (OOER!) and then fill up the egg with hot tea so it melts the inside. YUMMY!!! LOL!!! soo cute!! Happy Easter, Karen! Such a cute hilar bunny photo. Happy Easter! That is really funny. Happy Easter!